With the DVLA inspection a walk over all I had to do was in my lunch break head down to the Wimbledon office and pick up our V948 and tax disc. I immediately ordered our plates from fancyplates.com which compared to the rest of the service for kit car parts was outstanding. Ordered one evening with a nice little slogan at the bottom and they were with us the next day and for £9 cheaper than Halfords without having to leave home. Mum had called me earlier that day to say the plates had been delivered and myself and Dad thought the weather would hold out for the first drive. I couldn’t work all afternoon I was far too distracted with the final thought of getting a proper drive. I was in first so cleaned the back end up whilst still wearing my suit and then attached the new rear plate. Once dad was in we rolled it out with a real smile on our faces. Nerves started to set in – what if I didn’t like it or what if I couldn’t even drive it! I squeezed myself into the snug GRP seats and checked the pedals which confirmed they were all still there and working. I twisted the ignition key to hear the pump buzz into life. I reached for the start button and for a moment I thought it needed a charge but a dab of throttle hurled it into life. Dad gave me a push from the drive to the road and buckled himself in. Glasses on and mirrors checked and were ready to go. Nerves now washed from my head I was overcome with a rush of excitement, my hands twingling and feet itching to go. Clutch dunked and with a tug on the paddle it bangs into first. I feather the throttle and lift, an inch of movement and … stalled it – Doh! first of many I am sure. Second attempt and I am off although slowly rolling down the hill to my first junction. Waiting for an unusually large gap in traffic I booted it and WOW the exhaust barks then screams as the revs erupt round the clock tearing up the hill. The rattles present at idle disappear and the odd stone flicks up into the cabin as the sticky R888’s attack the tarmac. I make an effortless lunge for 2nd, then 3rd and then find we’ve caught up to the traffic not even sure where it had come from. As we approach a round about I need to stop and gently lean onto the pedal, nothing, a bit further then i find a little response from the cold Wilwood pads as they start to grasp hold of the discs and just make it to a hault. Road clear and indicator on I take the round about feeling like im in a go kart with the tiny OMP wheel involving a mini arm and shoulder workout. Building up speed and with the indicator still clicking away I leave it in 4th to relax as we take on the downward slope. Its then I notice the smoothness of the ride, its firm but so controlled and bumps I crash over every day in my Cupra R are dispatched with ease. After following the traffic into South Croydon I make a break away up to my girlfriends with another steep hill but its clear so I reach for the loud pedal again not even using half the revs before a shift, it feels rapid as the rush of wind blows around my face. We eventually get on the purley way and an embarrassing stall leaves the traffic on the inside lane passing by. God they look high up as even a small hatch lords it over us. Quickly I get it up and running again and bolt off the line with a healthy amount of revs just to make sure I don’t stall. With the speed camera turned round and the immature thought im a race car driver I stamp the accelerator pedal against the bulk head and weave through the traffic with my dad shouting, with the wind and engine noise I cant really hear but I dont think he's happy with my road behaviour but all I can think is I want to go faster and the MNR delivers. With an immense full throttle blast past me I start to let the car wind down focusing on the brakes, steering and controls. As I pass the local dump I find the steering and handling are in another league. I simply cannot fault it even at this relatively slow speed after a quick right, left. I didn’t even need to brakes as it is so planted and grippy. With my arse an inch or two from the tarmac and with other cars around I felt as if I was in a very thin and short car but that long bonnet and wide front track are deceiving and will take a while to get used to. Were almost home, taking things easy I dip the clutch and drop the revs and of course with not enough I stall it one last time but this time the roads are dead and I think we both laugh as there was no need to panic this time. Pulling up the brakes are warm and have greater bite and as we come to a stop the gearbox pings into neutral and the green glow of the clock shows how dark it has become. 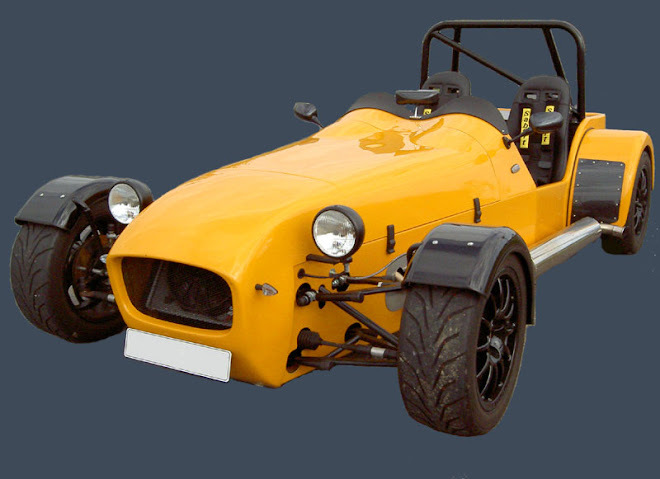 As we roll it back to its home in the garage the exhaust crackles and incredible heat rises from the bonnet then it hits me, that was awesome and slightly overwhelming, a year ago all it was, was a box of parts and a jungle jim now its close to a formula renault for the road. One last quick update - new original Yamaha emblems are on, hopefully nice and subtle. 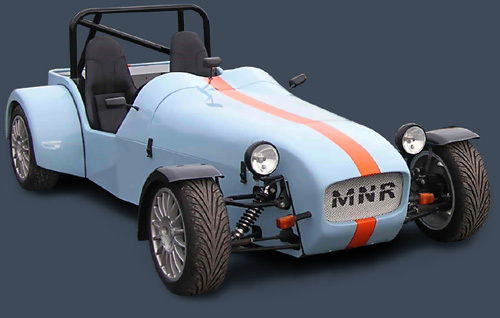 You probably cant read the slogan below the plate but it reads "MNR VORTX RT - BUILT BY BASSETTS"